Sod is essentially a ready-made grass lawn sold in sections. Sod installation has become the most effective way of achieving a beautiful green lawn quickly. Installing sod can provide instant gratification and the perfect vison of what you have to look forward to once your lawn is complete. It is not as simple as placing the sod in the desired area. The ground has to be prepped, the sod has to be placed properly, and once placed, the sod has to be cared for and watered vigorously. It is wise to seek professional help when considering sod application to your lawn to ensure success. This is where Michiana Commercial Landscape comes into play. Michiana Commercial Landscape specializes in sod installation in South Bend and surrounding areas. When determining how to prepare soil for sod planting, a soil test must first be completed. The results of the soil test will aid in determining how the existing soil will be treated in preparation for sod installation. 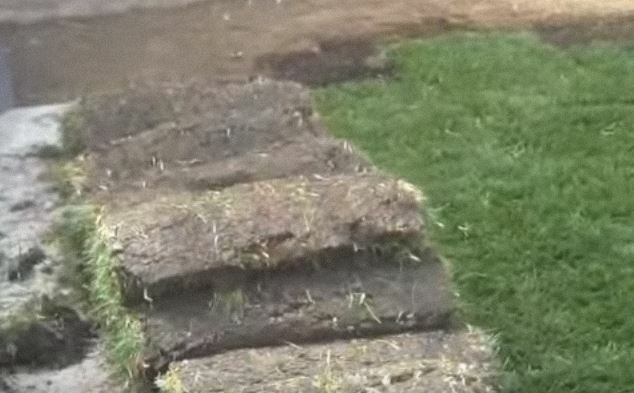 This step is essential in making sure that the sod survives long term. Soil needs to be tilled thoroughly, top soil may need to be added, and any soil corrections and fertilizers will need to be added prior to any installation of sod. If preparing clay soil for sod installation, topsoil with a depth of at least 6 inches needs to be added with organic material if soil is very heavy or sandy. The work that needs to be done before beginning to place the sod is of most importance and cannot be avoided if a desirable outcome is wanted. If the soil is not prepped prior to sod installation, the sod will more than likely die and be of no use resulting in wasted money and time. If unsure how to lay sod over an existing lawn area, think of the pattern of laying brinks. The concept is the same when it comes to how to lay sod squares on a lawn. First, you must measure the area and obtain the correct amount of sod. Sod may come in squares or rows. Either way, sod will need to be cut to fit the desired area. When placing sod, be sure to align the edges without overlapping. Gaps will create a patchy effect. Use your knife to fit sod around trees and other obstacles. Once the sod is positioned in the desired area, press sod firmly to the ground and soil by using a lawn roller. The key to sod installation is to be sure that the roots of the sod connects with the soil. Your work isn’t complete after sod has been laid. To care for newly laid sod, limit all traffic for the first few weeks of establishment. Water sod daily unless rain occurs for the first week later reducing to every other day. Tapper off watering as weeks past to allow grass roots to sink deeper into soil.